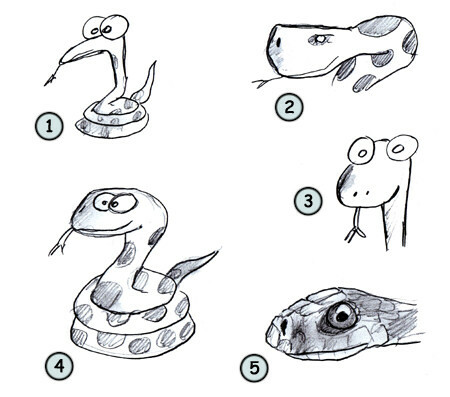 Drawing cartoon snakes: some fun facts before starting sketching! A snake can have 280 pairs of ribs or more! Most snakes will use their tongue to smell and help them find the right direction. A snake cannot hear but is able to feel vibrations. 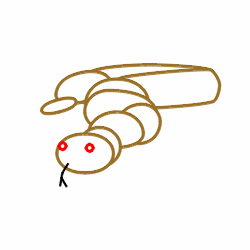 Before we learn to draw snakes, let's see what this feared animal is made of. Snakes are covered in scales (2). They can be very short (15 cm) or very long (close to 25 ft). They also have a forked tongue (4) and a long body made of a circular shape (1). They are usually colored in drawings using the green color (sometimes mixed with a little bit of yellow). Like I said earlier, the body of the snake is made of a cylinder shape. 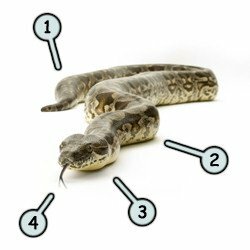 Since the skeleton of the snake is really complex, this animal can almost move his body in any directions. The tongue (that look like a "Y") can be drawn using a simple line. 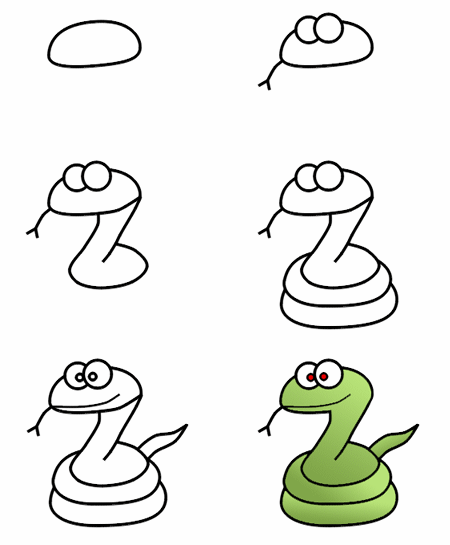 Drawing a snake is not really difficult (certain positions are more difficult). This part should look like a big "b". Continue your artwork by adding two more circles to complete the body. Add some pupils and the mouth and you are done! Drawing a snake can be really fun! Why not try to sketch a funny skinny one (1) or go the other way around and make a realistic one (5). The easiest way to draw a snake could be to draw one line for the body, two circles for the eyes and another line for the tongue! That's it! Good luck!